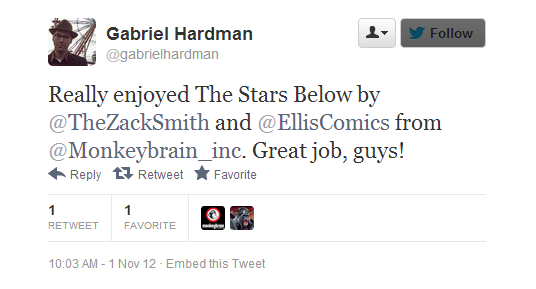 Hey readers — my first published comic, THE STARS BELOW with artist Rich Ellis,is now out from Monkeybrain Comics! You can buy it here for just 99 cents! Here’s an interview with me and Rich on the ComiXologist Podcast! Here’s another talk we did at Multiversity Comics! 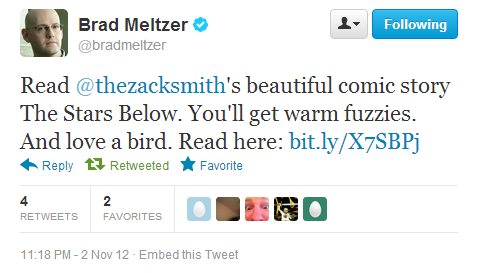 “A wonderfully little story about birds, the world, and seeking new heights & new discoveries. I loved this, the art is great. Cheap, fun, totally worth it. “I had a feeling that I would really enjoy this comic. I was not wrong, as this wordless story from Zack Smith and Rich Ellis was at times a fun little adventure and other times very poignant, and a nice little story about how even the littlest of guys can strive for more, and how sometimes there is a little wonder just around the corner for each of us. Ellis’ art fit perfect for the story, as his cast was very emotive (very necessary for a wordless story) and he did a really great job of selling some of the points that readers needed to reach for a bit more. “Altogether, this is about as much as you could possibly want from a $0.99 comic, and something that I’d be glad to share with audiences both young and old. Highly recommended from yours truly, and it’s a lovely little tale that is better experienced than written about. 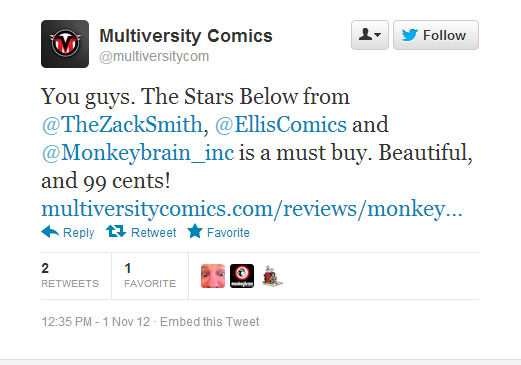 “I want to thank Zack Smith, Rich Ellis, and Monkeybrain Comics for making this available. It is charming from cover to cover and a feast for the eyes and imagination […]. “The artist, Rich Ellis, is the artist on Chris Roberson’s MEMORIAL for IDW. According to writer, Zack Smith, Ellis knocked this thing out as a fresh graduate from art school and before working on MEMORIAL. It is an impressive early effort by a strong talent. Smith, himself, has crafted a unique vision here that stands strong as an independent work in a crowded marketplace of super-heroes. “This one-shot written by Zack Smith and drawn by Rich Ellis (of IDW’s Memorial) is probably the strangest of the bunch this week. Not that it’s particularly gruesome or preposterous, but the story it tells is something not often seen in the realm of comics. The Stars Below follows a pigeon (not a Disney-esque talking pigeon, just a normal pigeon) who gets kicked into a planetarium where it sees the stars for the first time. Since the urban canopy of New York prevents him from seeing the stars, he sets out to perch on the tallest building he can find to get a glimpse of the real thing. “ A beautifully illustrated fable that is sure to a spark a sense of wonder in children and adults alike,The Stars Below is a brief but worthy chapter in the annuls of Great Animal Comics and undoubtedly the first (maybe the last?) to make a hero out of a Pigeon. Once again, you can buy the book here!